Establishment of the Wenzhou financial pilot zone as an answer to the private debt crisis? Concluding analysis: How risky is China’s capitalist system judging by its financial services industry? The main theme of the book is the globalisation of China’s markets and Chinese business management in the context of ongoing reform at home and the country’s growing global economic role. 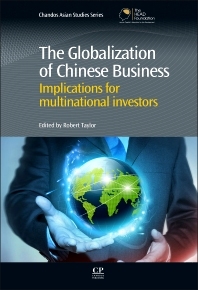 The Globalisation of Chinese Business includes contributions relating to a wide range of manufacturing and service sectors, encompassing such areas as foreign investment, state and private enterprise, human resource management, consumer culture and advertising, financial markets and healthcare. Following an introduction by the editor there are four sections, the first focused on the globalisation of Chinese management and the second on the evolution of Chinese management. The remaining sections contain chapters on China’s growing service sector, growing markets and competition, and healthcare system reform. An epilogue by the editor in the remaining section concludes. Robert Taylor was formerly Director of the Centre for Chinese Studies and Reader in Modern Chinese Studies at the University of Sheffield. He is the author of a number of studies and academic articles relating to Chinese business management and China’s foreign policy, including Greater China and Japan and the edited volume, International Business in China: Understanding the Global Economic Crisis. He also contributed a chapter on China to the volume, edited by H.Hasegawa and C.Noronha, Asian Business and Management: Theory, Practice and Perspectives. Former Director of the Centre for Chinese Studies and Reader in Modern Chinese Studies at the University of Sheffield.